WHO DIED IN INFANCY 1856. BORN 10TH APRIL 1830, DIED 27TH SEPT. 1908. DIED 19TH FEBY. 1948, AGED 83 YEARS. Surname: Ferguson Effects: £10,759 4s. 8d. 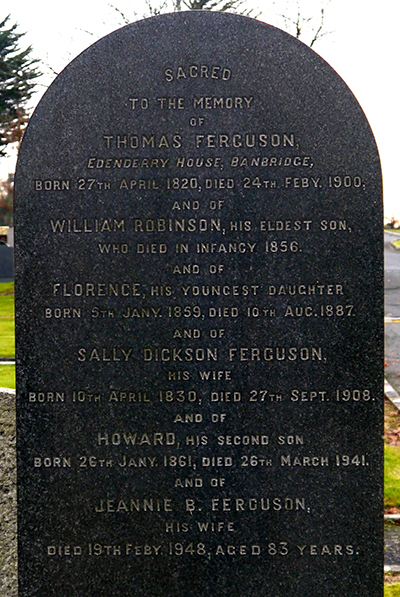 Probate of the Will of Thomas Ferguson, late of Edenderry House, Banbridge, County Down, Merchant, J.P. who died 24 February 1900 granted at Belfast to Howard Ferguson, Merchant, and Stanley Ferguson, Solicitor. Transcribed from information supplied by the Public Records Office of Ireland.